Boys navy 5 piece slim fit tail jacket suit for baby boys, toddler or older boy, perfect outfit for any special occasion including a wedding or formal occasion. 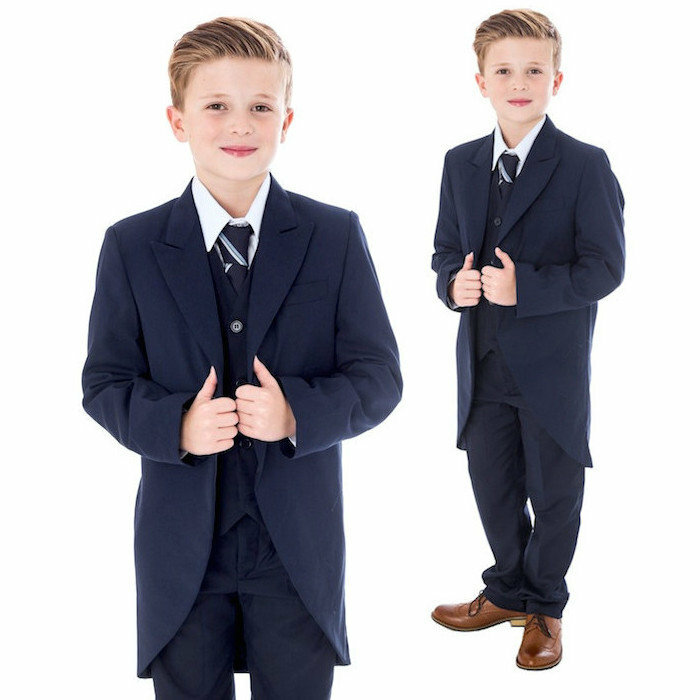 Waistcoat: Fully lined plain navy slim fit waistcoat, double pockets, 3 centre buttons, adjustable strap/buckle on back for perfect fit. 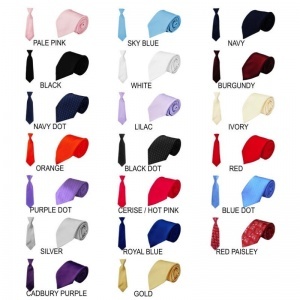 Tie: Satin effect navy tie with silver metallic stripe, elasticated neckband, complimenting the suit perfectly. 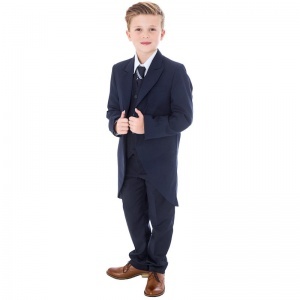 This navy 5 piece slim fit tails jacket outfit will make him look like the perfect handsome gentleman at a wedding as a page boy or a special occasion. 0-3 Months 21cm / 8¼" 34cm / 13½" 41cm - 46cm / 16" - 18" 48cm / 19" 51cm / 20" 16.5cm / 6½" 20.5cm / 8" 24cm / 9½" 53.5cm / 21" 12.5cm / 5" 24cm / 9½" 46cm / 18"
3-6 Months 23cm / 9" 38cm / 15" 43cm - 49cm / 17" - 19" 51cm / 20" 57cm / 22½" 18.5cm / 7¼" 23cm / 9" 27cm / 10½" 56cm / 22" 13.5cm / 5¼" 25.5cm / 10" 47cm / 18½"
6-9 Months 24cm / 9½" 39.5cm / 15½" 43cm - 49cm / 17" - 19" 53.5cm / 21" 58.5cm / 23" 20cm / 8" 24cm / 9½" 28cm / 11" 58.5cm / 23" 14cm / 5½" 25.5cm / 10" 51cm / 20"
9-12 Months 25.5cm / 10" 42cm / 16½" 46cm - 51cm / 18" - 20" 53.5cm / 21" 61cm / 24" 20cm / 8" 27cm / 10½" 29cm / 11½" 61cm / 24" 14cm / 5½" 25.5cm / 10" 53.5cm / 21"
12-18 Months 26.5cm / 10½" 43cm / 17" 46cm - 51cm / 18" - 20" 54.5cm / 21½" 63.5cm / 25" 23cm / 9" 28cm / 11" 30.5cm / 12" 62cm / 24½" 14.5cm / 5¾" 26.5cm / 10½" 56cm / 22"
18-24 Months 31.5cm / 12½" 49cm / 19" 47cm - 54.5cm / 18½" - 21½" 56cm / 22" 66cm / 26" 25.5cm / 10" 31cm / 12" 30.5cm / 12" 66cm / 26" 18cm / 7" 28cm / 11" 58.5cm / 23"
2 Years 35cm / 13¾" 51cm / 20" 51cm - 56cm / 20" - 22" 57cm / 22½" 67cm / 26½" 27cm / 10½" 34cm / 13½" 32cm / 12½" 68.5cm / 27" 20.5cm / 8" 32cm / 12½" 61cm / 24"
3 Years 38.5cm / 15¼" 56cm / 22" 51cm - 56cm / 20" - 22" 58.5cm / 23" 68.5cm / 27" 31cm / 12" 37cm / 14½" 32cm / 12½" 71cm / 28" 23cm / 9" 34cm / 13½" 65cm / 25½"
4 Years 43.5cm / 17¼" 61cm / 24" 52cm - 57cm / 20½" - 22½" 63.5cm / 25" 73.5cm / 29" 32cm / 12½" 39cm / 15½" 32cm / 12½" 71cm / 28" 25cm / 9¾" 35.5cm / 14" 67.5cm / 26½"
5 Years 45.5cm / 18" 65cm / 25½" 53.5cm - 58.5cm / 21" - 23" 66cm / 26" 76cm / 30" 33cm / 13" 41cm / 16" 33cm / 13" 73.5cm / 29" 26.5cm / 10½" 39.5cm / 15½" 67.5cm / 26½"
6 Years 47cm / 18½" 68.5cm / 27" 53.5cm - 58.5cm / 21" - 23" 68.5cm / 27" 76cm / 30" 34cm / 13½" 41cm / 16" 33cm / 13" 76cm / 30" 29cm / 11½" 43cm / 17" 71cm / 28"
7 Years 51.5cm / 20¼" 73.5cm / 29" 56cm - 61cm / 22" - 24" 68.5cm / 27" 77.5cm / 30½" 38cm / 15" 45.5cm / 18" 35.5cm / 14" 79cm / 31" 30.5cm / 12" 47cm / 18½" 72.5cm / 28½"
9 Years 60cm / 23½" 84cm / 33" 58.5cm - 63.5cm / 23" - 25" 76cm / 30" 86cm / 34" 42cm / 16½" 49.5cm / 19½" 38cm / 15" 84cm / 33" 35.4cm / 14" 49.5cm / 19½" 77.5cm / 30½"
10 Years 66cm / 26" 90cm / 35½" 61cm - 66cm / 24" - 26" 76cm / 30" 89cm / 35" 42cm / 16½" 51cm / 20" 38cm / 15" 84cm / 33" 37cm / 14½" 53.5cm / 21" 77.5cm / 30½"
11 Years 70cm / 27½" 93cm / 36½" 66cm - 76cm / 26" - 30" 79cm / 31" 91.5cm / 36" 44cm / 17½" 53.5cm / 21" 38cm / 15" 91.5cm / 36" 38cm / 15" 54.5cm / 21½" 81cm / 32"
12 Years 72.5cm / 28½" 96.5cm / 38" 66cm - 76cm / 26" - 30" 81.5cm / 32" 91.5cm / 36" 44cm / 17½" 53.5cm / 21" 38cm / 15" 96.5cm / 38" 39cm / 15¼" 56cm / 22" 84cm / 33"
13 Years 76cm / 30" 100cm / 39½" 68.5cm - 78cm / 27" - 31" 86cm / 34" 94cm / 37" 52cm / 20½" 62cm / 24½" 38cm / 15" 101.5cm / 40" 42.5cm / 16¾" 61cm / 24" 89cm / 35"
14 Years 80cm / 31½" 104cm / 41" 73.5cm - 86.5cm / 29" - 34" 86cm / 34" 95cm / 37½" 53.5cm / 21" 64cm / 25" 40cm / 16" 104cm / 41" 43cm / 17" 62cm / 24½" 91.5cm / 36"
Love the tail jacket! It is super adorable. Fit almost perfect on my son. Went to get it tailored for perfect fit. Can't wait for everyone to see him in it though!!! Great quality and worth every penny! 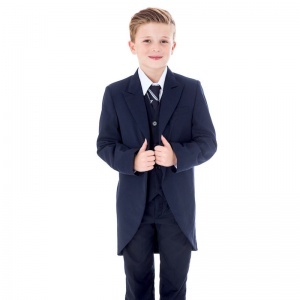 This suit is perfect, I wanted something so my little boys suit matched my partners and his groomsmen, I struggled until I found this, it's a perfect match and I can't wait to see my little boy in it on our wedding day. Would defiantly recommend and use yourselves again.